Alright, so there’s really no one way to do pretty much anything under the sun. That includes “How to Shop on Discogs” — there really is no RIGHT way. But this post is about how I shop and how I recommend shopping on the music marketplace platform. It’s also about how this method led me to discover a side project of a band I deem to be one of the greats: The Brian Jonestown Massacre. I was relatively late to hop on the Brian Jonestown Massacre train, truly only digging into their back catalog around the time Revelation debuted in 2014. It’s a shame, really, as the hazy psychedelic space rock sounds of BJM are right up my alley. For those unfamiliar, the band formed in 1990 and has since released well over a dozen records. Their latest LP, Don’t Get Lost, was released earlier this year. Despite having strong leanings toward the sound BJM creates, I feel I still have only scratched the surface with only about half a dozen LPs under my belt. That’s the problem with getting old. Other priorities take precedence. But, predominant in my collection are the 2014 LP Revelation on opaque blue vinyl, a cassette of the band’s 2012 release Aufheben, and a little known early side-project that could very well be the earliest example of the sound BJM would soon go on to create for over two decades. You cannot understand my introduction to BJM and the discovery of the band’s side project Acid without understanding my personal shopping behavior on the Discogs Music Marketplace platform. I have a process, you see. And that process rarely involves buying a single item from a Discogs seller, simply due to the shipping fee requirement (we’re not shopping on Amazon, after all). Instead, I like to spread the cost of shipping a record out across multiple items as most sellers will have an entry point shipping price followed by a much smaller incremental one. For example, I charge $4.5 shipping and handling for the first record, followed by $0.50 for each additional. Here’s how I approach ordering records on Discogs, and how it also becomes a process of exploration. First, you gotta find something you want at a price you’re willing to pay. Make sure that the shipping fees are reasonable and acceptable, too. I will typically stay away from international sellers for this reason alone: shipping overseas is damn expensive! Super easy. When you visit a seller page (example here), check out their catalog of For Sale items and you’ll see they have a count of how many items they’re selling that are on your want list. Cherry pick the ones you feel are priced reasonably. Note that reasonable pricing is dependent on a variety of factors, from current market pricing conditions and where the seller’s price falls in that spectrum and how much other sellers are listing the same item for, to how much you really want that album or single. On the right side of each seller’s page, you’ll find a search box that’ll allow you to dig further into the seller’s crate. I approach this with precision: I’ll start with a handful of bands I’m crushing on of late to see if there are any deep catalog items I haven’t thought of adding to my want list. Then, I’ll broaden the search to obscure record labels. Finally, I’ll round it out by searching by genre terms. Favorites include Voxx, Post Punk, Sub Pop, Garage, Psychedelic or a blend of these. 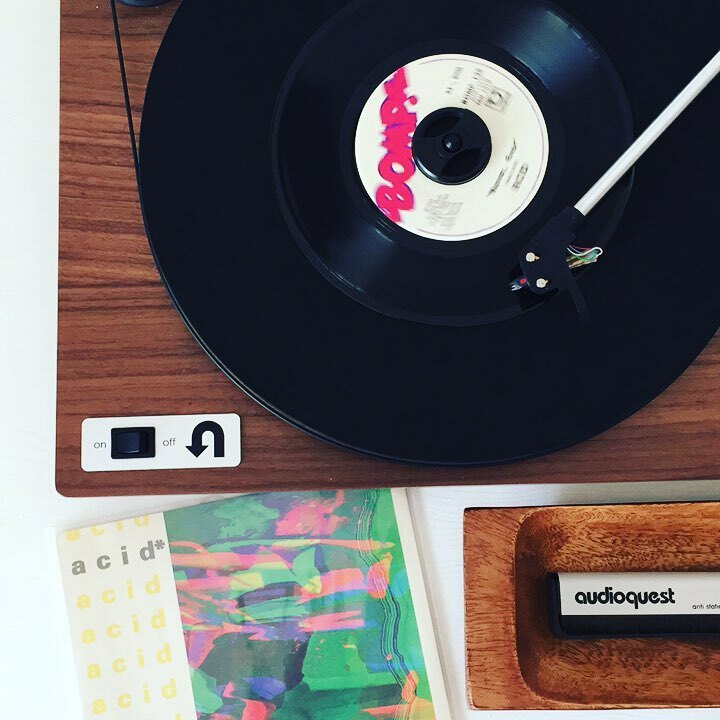 It was using this process that allowed me to stumble upon a 7-inch single by Acid, what appears to be a somewhat long lost side project of The Brian Jonestown Massacre. One that only the most devoted of BJM fans will likely recognize. I was a bit shocked, when following my three step process above, to stumble upon a little single from 1993 by a band called Acid. At the time, I was digging up obscure garage rock and psychedelic rock from the 80s and early 90s, so it’s likely I was scouring a seller’s page for either of those terms, or perusing their selection from the label Bomp! Records, which was responsible for a variety of greats over the years, from a handful of Iggy & The Stooges reissues to a stellar posthumous (for the band, at least) release by The Modern Lovers. A handful of other Bomp! releases have made it into my collection, too, and have become favorites. The debut release by Miracle Workers is a prime example, as is Wild Trip by oddball Swedish 80s garage rock revival band The Stomachmouths. I’m not entirely sure who in The Brian Jonestown Massacre participated in Acid, which saw a single 7-inch release in 1993 on Bomp Records. But whoever it was must play an integral part in the band, as Acid envelopes the sound The Brian Jonestown Massacre would go on to champion. Even as early as their 1995 debut, Methodrone, which blended psychedelic rock and shoegaze. Prior to that 1995 debut, BJM released a handful of singles, all of which have been classified as Shoegaze. Listening to those early singles, you can definitely hear shoegaze. The psychedelic elements that would soon follow and dominate are muted, if present at all. So, in essence, Acid may be the earliest presentation of what The Brian Jonestown would soon become. This lone and somewhat rare 7-inch includes two phenomenal tracks, “Never, Ever” and “Thoughts of You”. Picking a favorite is damn near impossible. Both blend the psychedelic-leaning desert rock-meets-space rock drone-like haze I’ve longed for incessantly over the past few years. More recent bands as diverse as Psychic Ills, Black Mountain, and the Global Chakra Rhythms side of JEFF the Brotherhood. I was lucky enough to snag my copy for about $6.25 a few years back, and the lone single available on Discogs is currently going for more than three times that. Have you stumbled upon any long lost records that gave you a little shock like this? I’m curious to know what you found, and how you found it! Leave a comment and tell your story! The Bats return with "Free All the Monsters"
Next Post Does Last Leaves’ New LP Pick Up Where The Lucksmiths Left Off?